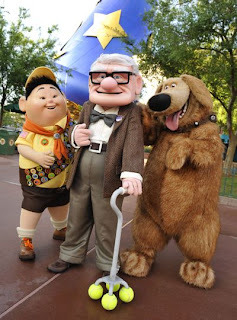 Cam's Cinematic Episodes: Epi-Cast: Episode 12 - "Gettin' Down With UP (Yo!)" Epi-Cast: Episode 12 - "Gettin' Down With UP (Yo!)" You can't keep a good podcast down. You can try but you will fail. Wanna know how I know? Cuz the Epi-Cast is back, droppin' rhymes, takin' names, giving you all the straight film-related poop you require. Despite a one week break from our usual bi-monthly schedule, we're back and ready to serve. NEXT! Epicast: Episode 12 - "Gettin' Down With UP (Yo!)" In which Cam and Tom put on their pixie shoes and frolic joyously around Pixar's latest beautiful gift for the senses, Up. Aside from the roughly 25-minute love-in with the film, and the studio's other magi-tastic wonders, they waste time nattering on about Sam Raimi's spook-a-blast odyssey Drag Me to Hell, Will Ferrell's baffling Land of the Lost and the surprise smash The Hangover. New flicks aside, Tom finally reports back from his first encounter with The Terminator while Cam shows some love for the 1981 Jack Nicholson box-office flop The Border. Plus, in a very special Trailer Park Encounters segment the dizzy duo puzzle over Scorsese's Shutter Island, giggle at Roland Emmerich's disaster epic 2012, snore through the preview for the John Travolta/Robin Williams mid-life crisis horror-show Old Dogs and, finally, snicker and scratch their heads over Twilight: New Moon. It's 90+ minutes more fun than a Robert Pattinson jockstrap fitting. Ew. P.S. : We also available on iTunes too. Simply do a shop search for "Epi-Cast" and PIA-ZADORA!, there we are! Oh, and we're movie-ramble show, not the holy roller one.